In the Tishreen camp for displaced persons in Aleppo, Syria, a boy carries a jerrycan he filled at a water tank built by OXFAM with UNICEF support. A facility that provides drinking water to more than two million people in and around the Syrian city of Aleppo has resumed its operations over the weekend, following a 48-day deliberate shutdown, the United Nations Children's Fund (UNICEF) reported. The al-Khafseh facility produces an average of 400 million litres of clean water daily. Drawing raw water from the Euphrates River, it is the sole source of drinking water for the entire city of Aleppo and eastern areas of the governorate. Water has been used as a weapon of war by all sides to the conflict in Syria. Millions of civilians are being deprived of clean water for drinking and domestic use. Tactics include shutting water off at the source, airstrikes and ground attacks on water facilities and hindering access for civilian workers to maintain, repair and operate facilities. 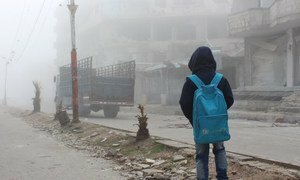 UNICEF has documented such tactics in areas including Aleppo, Damascus, Rural Damascus, Dar'a and Hama. In 2015 alone, over five million Syrians faced potentially life-threatening water shortages as a result. “Parties to the conflict must stop attacking or deliberately interrupting water supply, which is indispensable for the survival of the population,” Ms. Singer said, stressing that they should protect the treatment, distribution systems, pipelines and personnel who repair water installations. “Syria's children and their families have a right to safe drinking water and clean water for hygiene and health” she said. The al-Khafseh facility was deliberately shutdown on 16 January. Over the past weeks, UNICEF has been working closely with the Syrian Arab Red Crescent and the International Committee of the Red Cross (ICRC) to support water trucking, emergency repairs and rehabilitation so that water infrastructure systems are able to function to serve the entire population of Aleppo.